The normal response to inhaled Ag is the absence of Ag-specific IgE and cytokine production to later Ag challenges. Although the mechanism of this aerosol-induced IgE tolerance is not completely understood, it may prevent sensitization to inhaled Ags, which could otherwise lead to allergy and asthma. We examined the consequences of ongoing Th1 and Th2 responses in the lungs of mice during OVA inhalation to mimic conditions that may subvert tolerance and lead to sensitization. We found that concurrent, secondary Th2 lung responses to keyhole limpet hemocyanin or primary responses to Nippostrongylus larvae or Asperigillus fumagatus extract prevented establishment of IgE tolerance to aerosolized OVA. Intranasal rIL-4 given before OVA aerosolization also prevented establishment of tolerance, whereas concurrent Th1 responses to influenza virus or Mycobacterium bovis bacillus Calmette-Guérin had no effect. However, once established, aerosol tolerance to OVA could not be completely broken by OVA rechallenge concurrent with a secondary Th2 response to keyhole limpet hemocyanin or A. fumagatus extract, or by intranasal rIL-4. These data suggest that the immune status of the lung of an individual may profoundly influence the initial response to inhaled Ag, and that aerosol-induced IgE tolerance may not be appropriately established in individuals undergoing concurrent, Th2-mediated responses to Ags or pathogens. The lung is unique among mucosal compartments in that it is constantly exposed to airborne Ags during its function of gas exchange. Therefore, the lung compartment must maintain normal function while closely regulating the immune responses it mounts to inhaled Ag (1, 2, 3, 4, 5). Specifically, the respiratory immune system must differentiate between harmless airborne Ags and potentially infectious organisms such as fungal spores, bacteria, and viruses. In addition to structural defenses such as epithelia, cilia, and mucus, the lung has developed functional barriers such that inhalation of harmful pathogens results in the sensitization and up-regulation of the immune system, whereas the normal response to most nonpathogenic Ags is noninflammatory. Experimentally, inhalation of harmless aerosolized protein Ag usually results in the absence of Ag-specific Th2 responses such as IgE (aerosol-induced IgE tolerance) and IL-4 production but primes for Ag-specific IgG1 and IgG2a Abs (6, 7, 8, 9, 10, 11, 12, 13, 14, 15). Importantly, aerosol-induced IgE tolerance does not appear to involve either immune deviation or a shifted cytokine response from Th2 products such as IL-4 and IL-5 to Th1 products such as IFN-γ, or suppressive products such as IL-10. Importantly, IFN-γ and IL-10 are not specifically expressed following challenge of inhaled Ag, and IFN-γ−/− and IL-10−/− mice establish normal aerosol-induced IgE tolerance to hen egg OVA (15). In addition, our previous work demonstrated that this form of tolerance required neither CD8+ cells nor γδ+ T cells (15). Nor does aerosol-induced IgE tolerance appear to require Ag ingestion, as oral tolerance typically results in the down-regulation of all Ag-specific Ab isotypes, and the levels of Ag exposure during inhalation are insufficient to produce IgE tolerance via ingestion (15, 16, 17). In contrast to this normal state of Ag-specific IgE unresponsiveness, atopy in patients has been significantly associated with high levels of IgE and IL-4 production to sensitized Ag (18, 19, 20, 21). Thus, although unresponsiveness is likely to be the normal response to aerosol inhalation for most nominal Ags, sensitization can occur in some individuals to otherwise harmless Ags. The result of this sensitization can include elevated production of Ag-specific IL-4 and IgE, which, in turn, can result in bronchial hyperresponsiveness, cellular infiltration, allergy, and asthma (22, 23, 24). The modulation of immune responses by strong concurrent responses to unrelated Ags or pathogens has been investigated in a variety of experimental models. In general, these studies have examined either the ability of ongoing Th1 responses such as Brucella (25), Listeria (26), Influenza (27), and bacterial CpG (28) to inhibit Th2 responses or the ability of ongoing Th2 responses such as Nippostrongylus (29, 30, 31), Schistosoma (32), Brugia malayi (33, 34), and Heligmosomoides polygyrus (35, 36) to enhance IL-4 and IgE to unrelated Ags. More recently, viral infection has been demonstrated to sensitize mice to inhaled Ag (37). With these results in mind, we have investigated the effects of ongoing Th1 and Th2 responses during the establishment of aerosol-induced IgE tolerance. We demonstrate that ongoing Th2 responses, produced either by Ag challenge or infection or locally administered rIL-4 given during Ag inhalation can prevent the establishment of aerosol-induced IgE tolerance and lead instead to Th2 priming to OVA. These results suggest that the IgE and IL-4 unresponsiveness normally following Ag inhalation may be converted into a sensitization in the milieu of a concurrent, IL-4-producing Th2 response. These findings help suggest a mechanism for the establishment of aerosol-induced IgE tolerance and may have important implications for our understanding of acquired allergy and asthma in human disease. BALB/cAnN mice were obtained from Taconic Farms (Germantown, NY). Mice were between 5 and 7 wk of age at the beginning of each experiment and were housed under specific pathogen-free conditions at the DNAX Research Institute animal facility. Experiments were conducted following protocols approved by the DNAX Animal Use Review Committee. Fig. 1⇓ shows the standard treatment regimens for these experiments. OVA (grade V; Sigma, St. Louis, MO) was exposed to animals for inhalation as a 1% solution in PBS as previously described (15). Aerosolization was performed for 20 min every other day for 10 days (five times) from days 0–8. Previous studies have demonstrated that each aerosolization treatment delivers ∼5 μg/mouse. 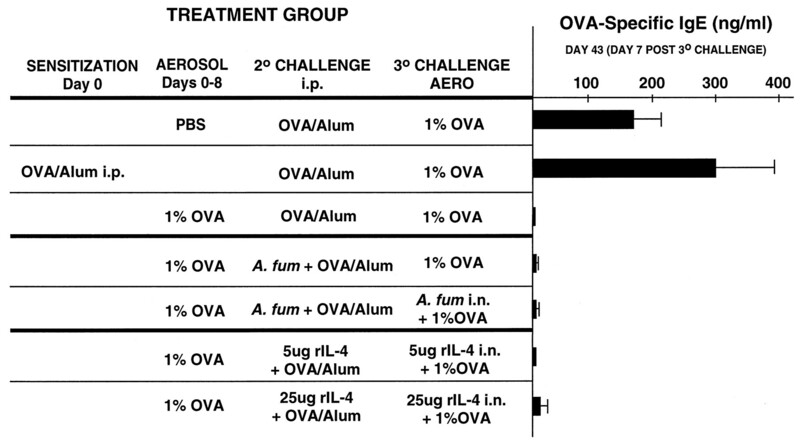 All treatment groups then received the following regimen of challenges: 7 days following the final aerosolization (day 15) mice were bled (prebleed), and later that day challenged with OVA. OVA sensitization and challenge was performed by i.p. injection of 10 μg OVA precipitated in 2 mg aluminum hydroxide (Alum)3 gel (OVA/Alum). Mice were then bled weekly on days 22 and 29 (referred to as day 7 post 2o and day 14 post 2o, respectively) and then given a final, 3o OVA aerosolization challenge on day 36 and bled on day 43 (referred to as day 7 post 3o). When indicated, 10 μg of keyhole limpet hemocyanin (KLH; Pierce, Rockford, IL) was delivered intranasally (i.n.) in PBS or injected i.p. in 2 mg Alum (KLH/Alum). In some experiments, mice were sensitized at day −7 (presensitized) before aerosolizations with i.p. injections of KLH/Alum. rIL-4 was purified at DNAX and was delivered i.n. in PBS. Treatment regimen. Groups of mice were treated as described in Materials and Methods for each experiment. Following these treatments, mice in all groups were challenged on days 15 and 33 and bled on days 22, 29, and 43. Any additions to the treatment regimen were performed as described in the text. Administration of infectious pathogens and pathogen extract was performed to maximize infection before the initial OVA aerosolization (day 0) as follows: mice were infected with 240 U of Influenzavirus strain A (a gift from Peter Doherty and David Topham, St. Jude’s Children’s Research Hospital, Memphis, TN) on day −7 before aerosolization. Nippostrongylus brasiliensis larvae (Nb) were prepared at DNAX as previously described (38). Mice were given 500 larvae s.c. at day −3 before aerosolization. Live Mycobacterium bovis bacillus Calmette-Guérin (BCG, a gift from Alan Sher, National Institute of Allergy and Infectious Diseases, National Institutes of Health, Bethesda, MD) was given to mice i.v. at day −14. Finally, 50 μg of Asperigillus fumagatus culture extract (39, 40) in 50 μl of PBS was given to mice i.n. on days 0, 4, and 8 of the standard aerosolization regimen for a total of three exposures. For IL-4 production, mice were aerosolized OVA at the end of the experimental time course. Five days following aerosolization, whole lung tissue homogenate was assayed in vitro for cytokine production as described (15). IL-4 was analyzed as previously described (41). Briefly, 96-well plates were coated with 11B11 mAb overnight. Plates were then blocked with 20% FCS-PBS containing 0.04% Tween 20 (Sigma) and washed, and sample supernatants were added. Plates were incubated overnight at room temperature and washed, and the second step mAb BVD6-BIO was added following dilution in 20% FCS-PBS containing 0.04% Tween 20. Plates were then incubated, washed, incubated with StAv-HRP, and then developed with tetramethylbenzidine (TMB) substrate (Kirkegaard & Perry Laboratories, Gaithersburg, MD). Plates were then stopped and read at 415 nm. Analysis of total and OVA-specific IgE was performed as previously described (15). Briefly, wells were coated with the IgE-specific mAb EM95. Wells were then blocked and washed, and serum samples were loaded. Samples were incubated overnight and then washed. For total IgE production, anti-IgE-BIO was added to wells, followed by StAv-HRP and then TMB substrate (Kirkegaard & Perry Laboratories). For OVA-specific IgE, digoxigenin-conjugated OVA (DIG-OVA) was added following sample incubation, followed by addition of anti-digoxigenin Fab coupled to peroxidase (Boehringer-Mannheim, Indianapolis, IN) and then TMB substrate. Plates were developed, stopped, and read at 415 nm. Data were analyzed using a statistical program, InstatP (GraphPad Software), and levels of Abs were calculated as mean and SEM. The two-tailed p values were calculated according to the Mann-Whitney U test. A value of p < 0.05 was considered significant. To investigate the effects of an ongoing, but unrelated, Th2 recall response during establishment of aerosol-induced IgE tolerance, mice were sensitized i.p. on day −7 with 10 μg of KLH/Alum to generate a Th2 KLH-specific T cell population in vivo. 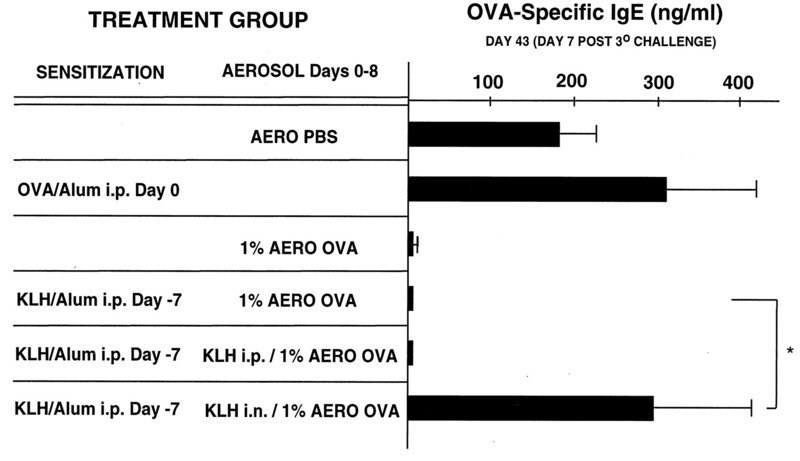 KLH-sensitized mice were then given the standard treatment regimen of five aerosolized OVA exposures, beginning at day 0, with or without an i.n. or i.p. challenge of 10 μg KLH in PBS immediately before each aerosolization. Additional control groups of mice were initially either exposed to aerosolized PBS, or sensitized with 10 μg OVA/Alum i.p., or exposed to aerosolized 1% OVA. All groups of mice were then challenged i.p. with 10 μg OVA/Alum and subsequently with aerosolized OVA and bled according to the standard regimen to determine the effect of the KLH-specific Th2 response on OVA-specific tolerance induction. The data shown in Fig. 2⇓ are the titers of OVA-specific IgE in the serum of mice at day 43 (day 7 post 3o challenge). Mice sensitized with KLH followed by i.n. administration of KLH immediately before each OVA aerosolization did not establish OVA-specific IgE tolerance to subsequent OVA challenges, but instead developed high titers of OVA-specific IgE compared with mice sensitized with KLH but not given KLH before OVA aerosolization (p < 0.05). In contrast, both control OVA-aerosolized mice and mice that were administered i.p. 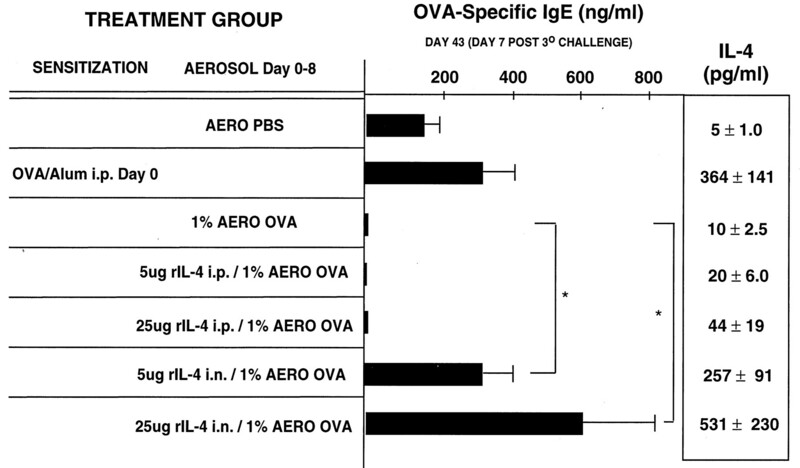 KLH immediately before OVA aerosolization established IgE tolerance, demonstrated by very low titers of OVA-specific IgE. These results suggested that a concurrent Th2 recall response to an unrelated Ag during the inhalation of OVA rendered the animal sensitized rather than unresponsive to OVA. In addition, these data demonstrate that the 2o Th2 response must be localized to the lung compartment during the inhalation of the unrelated Ag to prevent establishment of tolerance because i.p. challenge of KLH had no effect on establishment of IgE tolerance. OVA aerosolization during Ag recall prevents establishment of OVA-specific IgE tolerance. Naive BALB/c mice were primed i.p. with 10 μg KLH/Alum on day −7. Mice were then OVA aerosolized five times every other day (days 0–8) or aerosolized OVA following i.n. administration of 10 μg KLH in PBS. On days 15 and 22, all groups of mice were bled and challenged with 10 μg OVA/Alum i.p. Following these challenges, all groups of mice were OVA aerosol challenged again on day 36 and bled on day 43 (day 7 post 3o challenge). Data shown are the mean ± SEM of OVA-specific IgE titers (ng/ml) at day 43 as analyzed by ELISA. ∗, p < 0.05 vs control treatment group. Having established that a concurrent 2o response in the lungs of mice that had been previously sensitized to an unrelated Ag (KLH) was able to prevent establishment of aerosol-induced tolerance to a new Ag (OVA) we tested whether ongoing Th1 or Th2 responses to pathogens or pathogen extracts in the lung could prevent IgE tolerance. Previous work has demonstrated that pathogens such as Influenza (27) and BCG (42) can evoke a Th1 lung response dominated by IL-12 and IFN-γ, and pathogens such as Nb (38, 43) and extracts from A. fumagatus (39, 40, 44) cultures evoke a Th2 lung response dominated by IL-4. For Th1 responses, groups of mice were infected with Influenza on day −7, or BCG on day −14 before the initial aerosolization. In these experiments, batches of pathogens had been previously demonstrated to be infectious (45), and pathological examination of the lungs of an animal and in vitro recall assays confirmed successful infection (data not shown). In addition, RT-PCR analysis of inflammatory gene transcripts showed up-regulation at the time points used for Ag aerosolization (data not shown). For Th2 responses, mice were infected s.c. with 500 Nb on day −3 before the first aerosolization. Other groups of mice were administered 50 μg of A. fumagatus culture extract three times i.n. on days 0, 4, and 8 of the aerosol OVA treatments immediately before aerosolization for a total of three A. fumagatus administrations. All groups of mice were then challenged and bled according to the standard treatment regimen (Fig. 1⇑). The data in Fig. 3⇓ are the final OVA-specific IgE titers in mice at day 43 (day 7 post 3o challenge). The development of aerosol-induced IgE tolerance was unaffected by concurrent Th1-dominated lung infections of either influenza virus (2 ng/ml OVA-specific IgE) or BCG (2 ng/ml OVA-specific IgE). However, ongoing Th2-dominated lung responses to Nb or A. fumagatus during the inhalation of OVA prevented the establishment of aerosol-induced IgE tolerance as judged by the high titers of OVA-specific IgE to these treatments (148 and 750 ng/ml, respectively) vs OVA-aerosolized controls (p < 0.05). These data suggested that the ongoing Th2 responses within the lung during aerosolization of OVA were able to prevent aerosol-induced IgE tolerance, whereas ongoing responses to Th1-inducing pathogens had no effect. Ongoing Th2, but not Th1 pathogen responses prevent establishment of OVA-specific IgE tolerance. Naive BALB/c mice were administered live Influenza virus, BCG or Nb or A. fumagatus culture extract as described in Materials and Methods. Groups of mice were then exposed to aerosolized OVA and challenged as described in Figs. 1⇑ and 2⇑. Data shown are the mean ± SEM of OVA-specific IgE titers (ng/ml) at day 43 as analyzed by ELISA. ∗, p < 0.05 vs control treatment group. Having established that concurrent Th2 lung responses could prevent the establishment of aerosol-induced IgE tolerance to OVA, we examined the individual bleed time points and the status of OVA-specific T cells in nontolerant vs tolerant mice. As was shown in Fig. 3⇑, coadministration of Nb or A. fumagatus extract during aerosolization prevented IgE tolerance. However, close examination of individual bleed time points shows that this coadministration had the additional effect of converting the initial aerosolization of OVA into a priming exposure. This effect is demonstrated in Table I⇓ by the high titers of OVA-specific IgE in the A. fumagatus and, to a lesser extent, in the Nb-treated group compared with the control groups. This effect is demonstrated in Table I⇓ by the high titers of OVA-specific IgE in the A. fumagatus and, to a lesser extent, in the Nb-treated group compared to the control groups. In this experiment, naive BALB/c mice were administered Nb larvae or A. fumagatus extract and then aerosolized and challenged OVA as described in the legend to Fig. 3⇑. In addition, lung tissue was harvested and cultured for in vitro IL-4 production in response to OVA. Data shown are the mean ± SEM of OVA-specific IgE titers (ng/ml) during the experiment plus the IL-4-produced (pg/ml) in vitro in response to OVA protein. These results suggested that the coadministration of A. fumagatus extract and Nb during OVA aerosolization not only prevented the onset of tolerance, but also primed to OVA. These results suggested that the coadministration of A. fumagatus extract and Nb during OVA aerosolization not only prevented the onset of tolerance, but also primed to OVA. 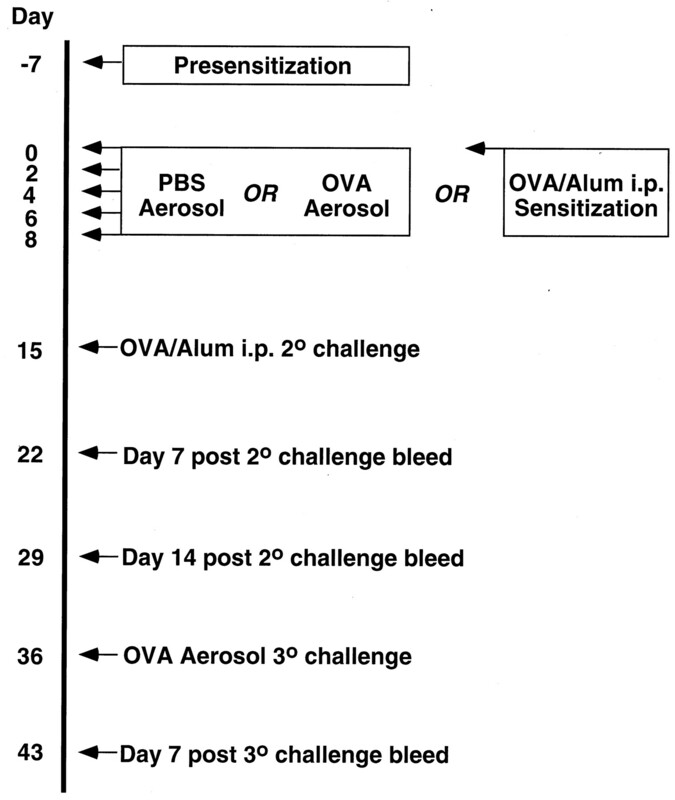 To further investigate this conversion of aerosol-induced unresponsiveness to a Th2 priming event we performed in vitro OVA challenge of lung cells 5 days following the 3o OVA aerosolization and assayed for OVA-specific IL-4 production. In comparison to the low IL-4 production by the control-aerosolized group (5 ng/ml), mice that had been aerosolized OVA in both the group that had been coadministered A. fumagatus extract during aerosolization or infected with Nb at day −3 before aerosolization produced high levels of IL-4 in vitro in response to OVA (245 and 192 ng/ml, respectively). Together, these results suggested that the ongoing Th2 lung responses to pathogens or pathogen extracts during OVA aerosolization not only prevented tolerance, resulting in high titers of OVA-specific IgE, but also primed for the differentiation of IL-4-producing OVA-specific T cells. Because IL-4 is the one cytokine capable of inducing Th2 differentiation, we postulated that IL-4 production was a key component in the prevention of aerosol-induced unresponsiveness to OVA by concurrent Th2 responses in the lung. To test whether IL-4 alone could inhibit aerosol-induced unresponsiveness, mice were administered rIL-4 immediately before each inhalation of OVA. Mice were then bled and challenged according to the standard treatment regimen. The data in Fig. 4⇓ show the OVA-specific IgE titers at day 43 (day 7 post 3o challenge). Administration of rIL-4 i.n. before OVA aerosolization was sufficient to prevent IgE tolerance compared with OVA-aerosolized control mice (p < 0.05). This ability to prevent tolerance was dose dependent, as 25 μg of i.n. rIL-4 resulted in higher OVA-specific IgE titers than did 5 μg of i.n. rIL-4. Furthermore, prevention of tolerance required local administration of rIL-4, as i.p. injection of rIL-4 had no effect. This finding argued that one critical component in the ability of ongoing Th2 lung responses to Nb or A. fumagatus extract to prevent aerosol-induced IgE tolerance and IL-4 unresponsiveness was their potential to evoke significant production of IL-4 from the host during aerosol exposure of OVA. rIL-4 i.n. administration is sufficient to prevent IgE tolerance. Naive BALB/c mice were administered either 5 or 25 μg i.p or i.n. immediately before each of five OVA aerosolizations. Data shown are the mean ± SEM of OVA-specific IgE titers (ng/ml) at day 43 as analyzed by ELISA, plus the IL-4 produced (pg/ml) by whole lung tissue homogenates in vitro in response to OVA protein. ∗, p < 0.05 vs relevant control treatment group. Because the establishment of aerosol-induced IgE tolerance could be prevented by a concurrent, secondary Th2 response, a strong primary Th2 response, or i.n. administration of rIL-4, we next investigated whether previously established aerosol-induced IgE tolerance could be broken by similar Th2 responses concurrent with Ag challenge. Mice were primed to KLH on day −7 by an i.p injection of KLH/Alum. 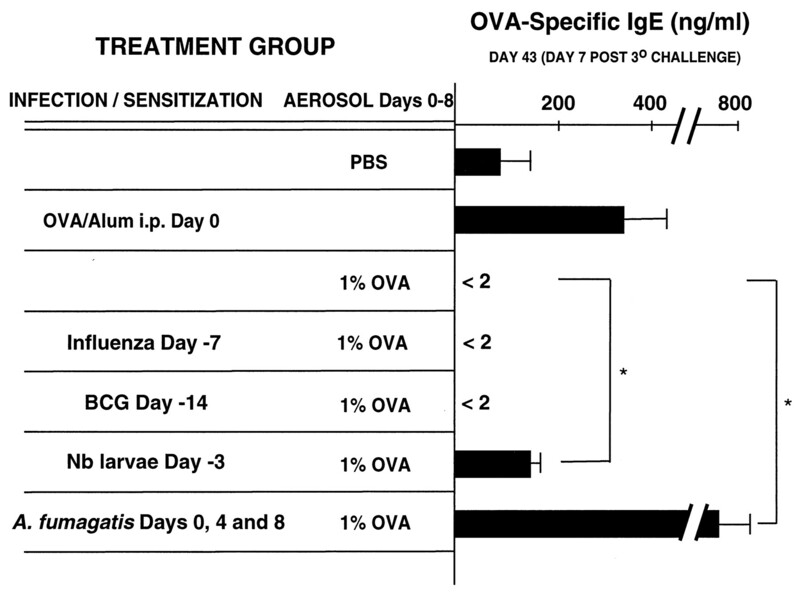 Mice were then given aerosolized OVA five times from days 0–8 to establish IgE tolerance and then challenged with either OVA/Alum or OVA+KLH in Alum on day 15. Subsequent bleeds and OVA challenges were performed according to the standard treatment regimen. The data in Fig. 5⇓ show the OVA-specific IgE and total IgE titers at day 43 (day 7 post 3o challenge). In contrast to the ability of a Th2 recall response to prevent the establishment of aerosol-induced IgE tolerance, the concurrent, Th2 recall to KLH during the challenge to OVA was unable to break established tolerance. Nor was the Th2 response to KLH inhibited by concurrent OVA challenge, as high levels of both total IgE and anti-KLH IgE resulted from this challenge (Fig. 5⇓ and data not shown). Established IgE tolerance cannot be broken by subsequent Ag-specific Th2 responses. Naive mice were primed with 10 μg OVA/Alum or 10 μg KLH/Alum as described in Figs. 1⇑ and 2⇑. Groups were then aerosolized and finally challenged with 10 μg OVA/Alum or 10 μg OVA/Alum mixed with 10 μg KLH/Alum. Data shown are the mean ± SEM of OVA-specific IgE titers (ng/ml) at day 43 as analyzed by ELISA. In previous experiments, mice that had been given A. fumagatus culture extract during aerosolization of OVA did not establish IgE tolerance, but instead produced high titers of OVA-specific IgE in the serum and high levels of IL-4 during in vitro restimulation with OVA (Table I⇑). Therefore, we tested whether administration of a strong Th2 stimulator such as A. fumagatus or rIL-4 could break previously established IgE tolerance. In Fig. 6⇓, mice that had been tolerized by five OVA aerosolizations were challenged with OVA/Alum, A. fumagatus + OVA/Alum, 5 μg rIL-4, or 25 μg rIL-4. For the 3o challenge some groups of mice were given additional A. fumagatus or rIL-4 i.n. before aerosolization. However, despite concurrent administration of these highly potent Th2 inducers, the IgE tolerance to OVA remained intact as indicated by very low levels of OVA-specific IgE. The effectiveness of the A. fumagatus and rIL-4 administrations were demonstrated by detection of high serum titers of total IgE (1325 and 80 ng/ml, respectively) in the same mice that maintained IgE tolerance specifically to OVA. This finding demonstrated that previously established IgE tolerance cannot be broken, even by very strong inducers of Th2 responses, including rIL-4. In addition, these findings suggest that, once established, IgE tolerance is strongly imposed on the immune system, and that the same mechanisms that can prevent the establishment of this tolerance, i.e., IL-4, cannot break it. Finally, the finding that total IgE can be highly induced in the absence of previously tolerized, Ag-specific IgE suggested that the simple absence of IL-4 in the lung may not account for IgE tolerance following aerosolization. Instead, it may be that IgE tolerance following Ag inhalation was imposed upon the immune system of the lung in both the Ag-specific T cell as well as B cell populations. Established IgE tolerance cannot be broken by either A. fumagatus extract or rIL-4 administration. Naive mice were primed or exposed to aerosolized OVA as described in Figs. 1⇑ and 2⇑. For the 2o i.p. challenges some groups of mice were given 10 μg OVA/Alum, 10 μg OVA/Alum mixed with 50 μg A. fumagatus extract/Alum, 5 μg rIL-4, or 25 μg rIL-4. For the 3o challenge, mice were given i.n. 50 μg A. fumagatus in PBS, 5 μg rIL-4, or 25 μg rIL-4 immediately before OVA aerosolization. Data shown are the mean ± SEM of OVA-specific IgE titers (ng/ml) at day 43 as analyzed by ELISA. In this report we have investigated the mechanism of aerosol-induced IgE tolerance. This tolerance is established following the inhalation of small amounts of aerosolized Ag and results in the absence of Ag-specific IgE in vivo, and both Th1 and Th2 cytokines upon Ag restimulation in vitro. It is important to note that the establishment of aerosol-induced IgE tolerance does not appear to involve either immune deviation or a shifted cytokine response from Th2 products such as IL-4 and IL-5 to Th1 products such as IFN-γ (15). On the contrary, this unique tolerance appears to result in the absence of both Th2 and Th1 cytokines, and the production only of Ag-specific IgG1 and IgG2a. Aerosol-induced tolerance may be a normal, protective consequence of Ag inhalation that serves to prevent the sensitization of the immune system to commonly encountered Ags. However, we speculated that environmental factors that could subvert the establishment of aerosol-induced tolerance may have the potential to redirect a tolerizing Ag encounter into a sensitization. In this report we have demonstrated that the establishment of normal IgE tolerance to inhaled OVA Ag could indeed be subverted by strong, local Th2 responses, but not Th1 responses, to unrelated Ags or pathogens in the lung, and that this prevention was largely the consequence of local IL-4 production immediately before inhalation of OVA. In our system an i.n. KLH challenge to sensitized KLH/Alum before the primary exposure of mice to OVA by aerosolization resulted in the sensitization, not tolerance, of mice to OVA. This sensitization was easily demonstrable by high titers of OVA-specific IgE and Th2 cytokine production. Likewise, infection of mice with Ags such as Nb or exposure to A. fumagatus extract, both of which produce vigorous Th2 responses, prevented the establishment of IgE tolerance to aerosolized OVA. However, concurrent Th1-inducing infections such as BCG and Influenza were not able to prevent establishment of this IgE tolerance. Likewise, the absence of OVA-specific IgE in mice that had been infected with either the Th1 pathogens BCG or Influenza does not appear to be the result of inhibitory levels of IFN-γ, as positive control mice that had been sensitized with OVA/Alum following infection showed high titers of OVA-specific IgE. This is in contrast to the results obtained from mice that had been given the Th2 pathogens Nb or A. fumagatus extract before OVA aerosolization, where titers of OVA-specific IgE were far higher that the OVA-aerosolized mice. Provocation of endogenous IL-4 was identified as the mechanism most likely responsible for preventing the establishment of IgE tolerance, as coadministration of rIL-4 alone during Ag aerosolization was sufficient to prevent unresponsiveness and led to priming a Th2 response. It is also noteworthy that administration of Th2 pathogens such as Nb or A. fumagatus extract, or administration of rIL-4 not only prevented the establishment of aerosol-induced tolerance, but resulted in the priming of mice to aerosolized OVA and to the in vivo differentiation of OVA-specific Th2 cells. This finding suggests that the respiratory immune response to Ag is strictly binary in that mice became either completely tolerant following aerosolization of OVA or became highly primed for OVA-specific IgE and Th2 cytokines following administration of Th2 pathogens or rIL-4 before aerosolization. This strict binary response may reflect the normal course of immune differentiation in the lung compartment to novel Ags and suggests that the early stages of establishment of complete IgE tolerance following inhalation may be inherently fragile. The contribution of IL-4 in the switching of Ag-specific B cells to IgE producers was closely examined by administration of rIL-4 i.n. before OVA aerosolization. These experiments showed that high, local concentrations of rIL-4 were sufficient to prevent the establishment of IgE tolerance in mice following aerosolization. Interestingly, systemic delivery of rIL-4 was not able to redirect the course of tolerance development, most likely due to insufficient local concentrations of both IL-4 and Ag. It is important to reiterate that the delivery of rIL-4 to the lung resulted in Th2 priming of T cells in addition to high titers of IgE. This result was demonstrated by the production of IL-4 by T cells from the lung following in vitro restimulation with OVA. This result suggests that the administration of rIL-4 was not simply bypassing the T cell compartment of the lung and causing B cell switching to IgE, but instead was provoking the Th2 sensitization of the respiratory immune system to OVA. Our data showing that the delivery of rIL-4 alone is sufficient to mimic the sensitization results obtained with KLH lung challenge, Nb, or A. fumagatus extract suggest that the ability of these strong Th2 challenges to promote IL-4 production was a critical step in the prevention of IgE tolerance, subsequent sensitization to OVA, and permanent misdirection of the IgE response. Also, preliminary experiments using blocking Ab to IL-4 suggested that eliminating the production of IL-4 by A. fumagatus extract could prevent sensitization to inhaled OVA (data not shown). In this experimental OVA aerosolization system the prevention of IgE tolerance by ongoing Th2 responses was accompanied by the production of IL-4 during in vitro Ag challenge. This finding may be important for future studies that may more directly dissect the mechanism of aerosol-induced tolerance. Although the precise mechanism of this tolerance remains elusive, we speculate that the small increase in IgE that has been observed by our group as well as other investigators (46), following the initial Ag aerosol treatments, may be somehow down-regulated before later Ag challenges by a mechanism involving the down-regulation of IL-4 production. In fact, we have found that shifting the OVA/Alum i.p. challenge to a proximal time point immediately following the final aerosol treatment prevents complete IgE tolerance (S.D.H., unpublished results) perhaps by reactivation of Ag-specific IL-4-producing T cells before this down-regulation. This finding suggests that there may be a critical IL-4 regulatory event in the establishment of IgE tolerance and that any Th2 response that undermines this event can result in the continuing production of IL-4 and the induction of IgE. Thus, although additional mechanisms involving other cytokines or cell populations may be important at maintaining tolerance at distal time points from Ag aerosolization, the shutoff and continued absence of IL-4 appears to be critical for initial establishment of tolerance. However, in contrast to the prevention of tolerance by Th2 responses, established aerosol-induced IgE tolerance cannot be broken by concurrent Th2 responses, even by Th2 responses that normally result in very high titers of IgE when administered concurrently with Ag aerosolization. The inability of strong Th2 stimulation to break established tolerance suggests that the mechanism that prevents T or B cell responses is highly dominant. This result also suggests that the mechanism of established tolerance may partially involve B cell tolerance. In each experiment IgE tolerance at late time points was accompanied by high titers of Ag-specific IgG1 (data not shown) and total, nonOVA-specific IgE. In our attempts to break established IgE tolerance specific to OVA we administered high, systemic doses of rIL-4. Presumably, B cells that were actively producing OVA-specific IgG1 were exposed to rIL-4 during the course of these experiments. However, despite the presence of this rIL-4 these B cells did not demonstrate significant switching to OVA-specific IgE but instead maintained their status as IgG1-only producers. In preliminary experiments we observed that depletion of T cells following tolerance induction with mAb resulted in low titers of OVA-specific IgG1 (data not shown). This finding may suggest that Ag-specific T cells are maintained and that their help is critical for OVA-specific IgG1 even in the absence of OVA-specific IgE. Whether these findings reflect a currently unappreciated mechanism of IgE regulation at the cellular level is unknown. However, these data may reflect the ability of an individual to establish and maintain lifetime insensitivity to inhaled allergens provided that tolerance to the allergen was appropriately established upon initial exposure. Modulation of IgE and IL-4 production by bystander responses has been previously described with a variety of Th2-inducing infections. These reports demonstrate that ongoing responses to pathogens can dramatically alter the normal immune response to Ag. Both Schistosoma and Brugia malayi microfilariae infections can up-regulate IL-4 production to concurrently sensitized Ag (32, 33). In addition, oral tolerance to Th2 responses does not completely establish itself in mice with gut infections of the helminth H. polygyrus (35). Experimentally, the phenomenon of allergen sensitization via the lung as a result of coincidental exposure to environmental “adjuvants” or infectious agents has also been previously described. Among the infectious factors that may contribute to permanent IgE sensitization are respiratory syncytial virus (RSV) (47, 48, 49, 50, 51), Rhinovirus (52, 53), Bordetella pertussis (54, 55, 56, 57), and EBV. In addition, the ability of environmental factors to alter the development of IgE tolerance such as exposure to smoke, diesel particles, or ozone has been described (58, 59). Among infectious pathogens the most thoroughly characterized in its ability to modulate the lung immune response is RSV. The first demonstrations that RSV could alter immune responses in mice suggested that OVA exposure following infection resulted in Ag sensitization as determined by hyperreactivity, although the mechanism of this effect was unclear (48, 49, 60). RSV-infected murine lungs were characterized by increased eosinophilia, cytokine production (including IL-4), and inflammation, including up-regulation of adhesion molecules and chemokines. Additionally, in a bovine model RSV infection has been shown to enhance sensitization to subsequent airway Ag (61, 62). Although still controversial, a variety of studies suggest that individuals who suffered an RSV infection during childhood are significantly predisposed to develop allergy and atopy either during early adulthood or later (63, 64, 65, 66, 67, 68, 69, 70). Experimental infections with rhinovirus in humans have also been demonstrated to alter lung responses to allergens (71, 72). Subjects who were infected with rhinovirus showed heightened sensitivity to airway challenge to ragweed allergen during infection as measured by histamine release and bronchoalveolar lavage eosinophils. Importantly, this heightened sensitivity was observed up to 1 mo following resolution of Rhinovirus infection, suggesting that the consequences of the altered lung environment could persist for long periods of time. These investigators also demonstrated that experimental Rhinovirus infection resulted in increased late asthmatic reactions (LARs), which may also be an important factor in subsequent allergen sensitization. It is relevant to note that although the pathogens we selected for our studies, Influenza, BCG, and A. fumagatus, are experimentally useful they are, along with RSV, perhaps most important in their clinical relevance and frequency. Initially, it may be confusing how antiviral responses that are normally characterized as IFN-γ-dominated Th1 responses can produce an IL-4, IL-5-rich Th2 milieu, resulting in allergen sensitization. However, there is clear evidence of virus-specific CD4+ T cell responses consisting of both Th1 and Th2 cytokines (73, 74) as well as evidence arguing that CD8+ T cells can produce prototypic Th2 cytokines (19, 75). So-called Tc2 cells have been shown to produce both IL-4 and IL-5. Additionally, in a transgenic system, CD4+ Th2 recall responses to sensitized OVA were able to redirect the CD8 antiviral peptide response to the production of IL-5 and subsequent eosinophilia (76, 77). Also, it is clear that Th2 sensitization can occur in the lung even in the presence of significant IFN-γ concentrations (78, 79, 80). In fact, in contrast to our findings it has recently been suggested that similar types of IgE tolerance may be inhibited by Influenza infection, although the Ag administration, challenge, and infection time points are different from those described here (81). From these and other studies it is apparent that in vivo immune responses to complex pathogens such as respiratory viruses may not be exclusively either Th1 or Th2 in nature, and that sufficient IL-4 and IL-5 may be produced to skew subsequent allergen responses. In addition, although our system of modulated OVA tolerance may be useful for the analysis of IgE regulation there clearly exist multiple pathways to the complex pathology of clinical asthma (82, 83). In conclusion, we have demonstrated that ongoing Th2 responses to Ags or pathogens can prevent the establishment of aerosol-induced IgE tolerance. These results underscore the importance of our understanding the normal regulation of IgE and Th2 cytokines in response to inhaled Ag, and in addition, of our understanding the mechanisms that may subvert this normal regulation during the onset of lung disease. We propose that these results demonstrate the subversive potential of ongoing Th2 responses that may contribute to the acquisition and maintenance of allergen sensitivity in susceptible individuals. The accumulation of sensitivities to several harmless, airborne Ags could in turn produce a cascade effect, where new Ags would be encountered in a constantly IL-4-rich Th2 milieu. This acquired allergy scenario could eventually lead to cellular infiltration and bronchial hyperresponsiveness. A further understanding of the mechanisms involved in aerosol-induced IgE tolerance and the factors that maintain it may contribute to clinical intervention of lung disease. ↵1 DNAX Research Institute is supported by Schering-Plough (Kenilworth, NJ). 3 Abbreviations used in this paper: Alum, aluminum hydroxide; KLH, keyhole limpet hemocyanin; Nb, Nippostrongylus brasiliensis larvae; BCG, Mycobacterium bovis bacillus Calmette-Guérin; i.n., intranasal(ly); TMB, tetramethylbenzidine; RSV, respiratory syncytial virus.